A ground-source heat pump utilizes the grounds natural temperature stability (around 50°F year round) to absorb and dissipate heat during different seasons. A ground loop is used to facilitate heat transfer underground. The ground loop is filled with a mixture of water and anti-freeze fluid. As refrigerant travels through an evaporator, it absorbs heat from the ground loop causing the refrigerant to evaporate into a gas. A compressor is used to further heat the gas. 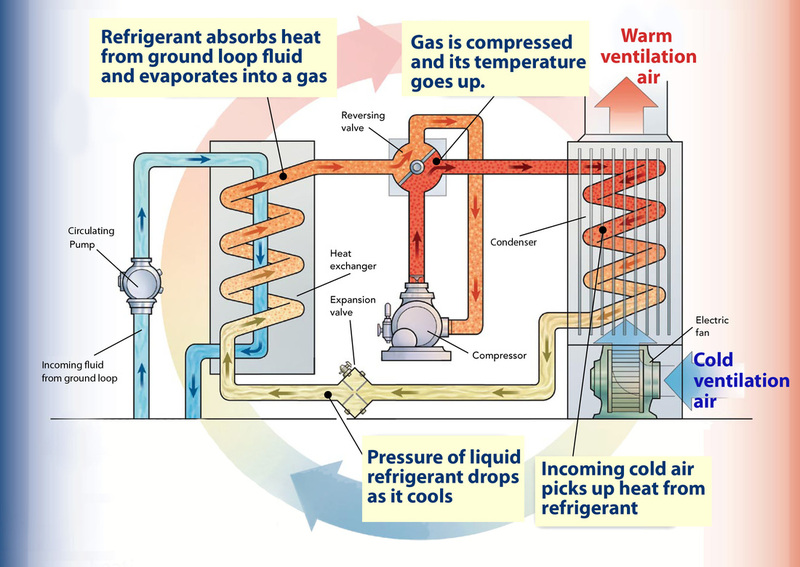 Once heated, the gas travels through a condenser that cools the gas, releasing heat as it turns back into a liquid. The released warm air is sent through a ventilation system using a fan. After returning to a liquid state, the refrigerant passes through an expansion valve that decreases the pressure, further cooling the refrigerant and starting the process over again. The process can also work in reverse in order to cool inside spaces. See also, "What is an air-to-air heat pump?"